You’ve invested in an RV, and now it’s time for a cover. 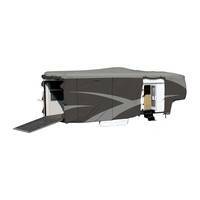 We are proud to offer ADCO RV covers for Fifth Wheels and Toy Haulers. Our ADCO Fifth Wheel and Toy Hauler covers come in a variety of sizes ranging up to 40 feet in length. So no matter if your Fifth Wheel is a Jayco, a Keystone or something else, we have you covered. We stock these covers and regularly ship the same day that you place your order. Exclusive to the RV industry, ADCO offers Tyvek and SFS Aquashed covers with an eye-catching design. Warrantied for two years, both Tyvek and SFS Aquashed offer protection for your paint from environmental irritants. SFS Aquashed is gray as pictured, and Tyvek comes in an attractive tan shade.